Hardworking always at "The Spot". Look for the big dude with the big drawings! 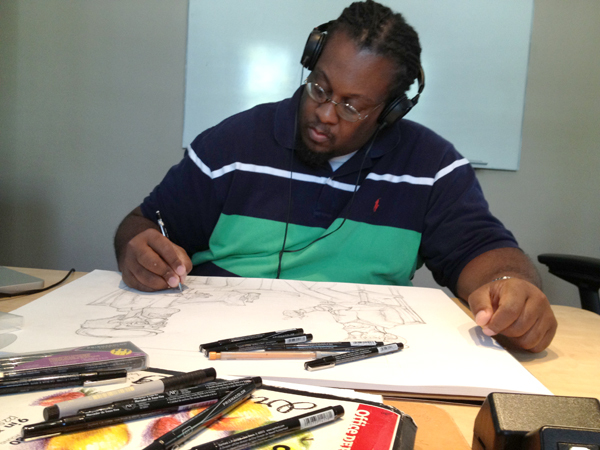 Jason "Big J" Thomas is an Atlanta-based visual artist who works primarily in pen-and-ink. His artwork tends to be very detail oriented. Jason has been drawing since he was a small child and has been a paid artist since the age of 12. Since moving to Atlanta in 1993, Jason has been active in the city's art scene as a student at Morehouse College where he majored in Art Education. He went on to work as a freelance illustrator, the president of a t-shirt company (Creative Energy 360) and a part-time art teacher. Jason is currently the Resident Art Director for iNetwork, Inc. and the illustrator of the Facebook comic strip "The Adventures of Mavis and Mary". Some of the more recent art shows Jason has curated while with iNetwork, Inc. are the "Night of Art and Flair" show at Georgia State University in the Fall of 2009, the "New Era in Art" shows at the New Era hat store (July 2010-2011) and the "Black Hairstory" art show at the Ella Rose Salon in East Point, Georgia (February 2012). Jason has been a participating artist at the "Resistance is Futile" art show (Mano Art Shows August, 2011) and the "CAIN" (Creative Arts Industry Night) art show (Mano Art Shows May, 2012) Jason's most recent curated show was the iNetwork Standing on the Shoulders of Giants Art Show at the Art of Giving Gallery (Atlanta, Ga) February 28 2013 . He has been an art instructor at the Boys' and Girls' Club in Atlanta's historic West End, The Conservatory of Dance and Fine Art in Decatur, Georgia and the North Highland YWCA. In October 2011, Jason was a featured career panelist at the Spelman College Homecoming Alumnae Art Majors Event where he spoke to senior Art Majors in an effort to help guide them along a successful path as future artists and art educators. He has also began to mentor students at Frederick Douglass High School (Atlanta) and also at his alma mater Elbert County Comprehensive High School in Elberton, Ga. Jason has recently been a sponsor/participant for the Black Book Conversation (a monthly artists' workshop) and the ART IS KING 3 day artists workshop held in November. He is also a recent graduate of the League of Art Entrepreneurs Class of 2013. The LAE is a 6-month business preparation course hosted by some of Atlanta's premiere art professionals. The graduation ceremony was held during the 2013 "Me, Myself and I" art show at the Atlanta Tech Village for the ART IS KING weekend (November, 2013).